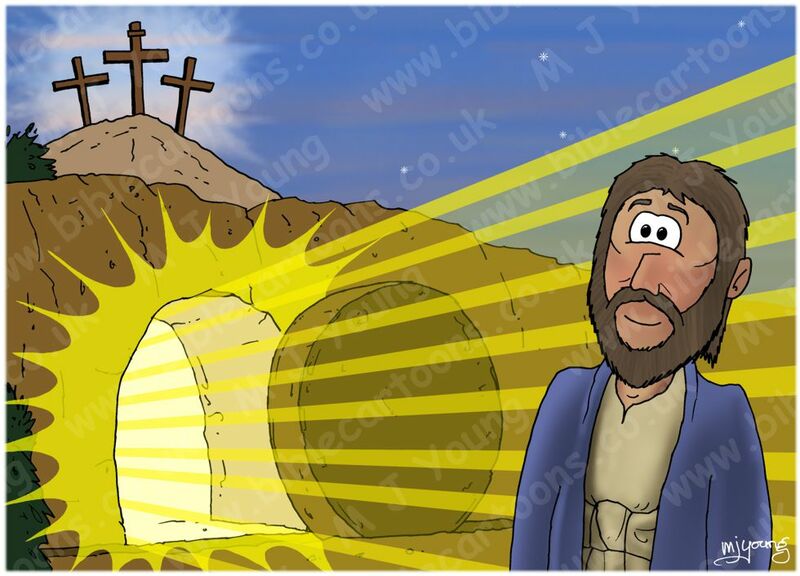 During the run up to Easter 2011, we have been advertising on Facebook, to make people aware of the Bible Cartoons Project (BCP) & to highlight the Easter cards & Easter cartoons we have available. This particular advert image was created specifically for the Facebook ad campaign. It shows the newly resurrected Jesus standing outside the tomb where his body had been placed, after his death on the cross. I don’t suppose there were any radiating lines of light & glow about the tomb, but I have used artistic licence to make the point that this is a miraculous event! Facebook adverts are only very small, typically the image/photo/cartoon you see on one is only 99 × 72 pixels, which isn’t a lot! It can be quite hard to make out what the image is showing! So I thought it would be a good idea to show them larger here.